JDE ROCKET is an external tool that may be used on an EnterpriseOne fat client. JDE ROCKET uses the connection of Solution Explorer to access the system, the work with it is extremely easy and no installation nor setup is necessary. Just copy the program to the fat client, start it and it is immediately ready to work with. 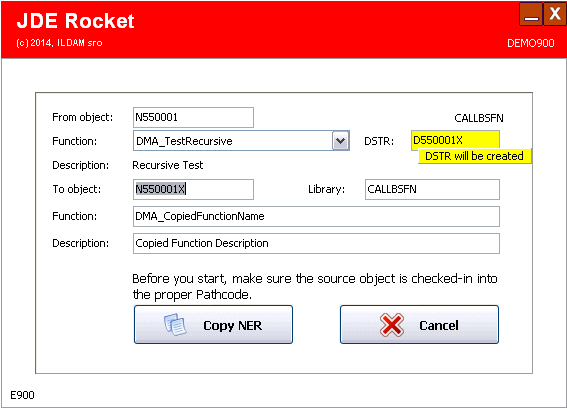 Copy NER (Named Event Rules) easily and quickly in EnterpriseOne, the process takes just a few minutes and it's user friendly. You can even copy the data structure to be able to modify the parameters without touching the original object. Do you wish to copy multiple versions from one report to another? You can do it with Jde Rocket very quickly incl. the PO values, data selection and sequencing and even section overrides. Please visit the product's page for more information: Jde Rocket.